Shop the stunning collections of luxury vinyl flooring at our locally owned and operated flooring store. Count on our friendly design and sales professionals to give you all the help you need to choose the luxury vinyl tile you would like in your home or place of business. Discover hundreds of choices in a variety of styles inspired by nature, fashion, and art – all at competitive prices. We attribute the success of our business to exceptional customer service. When you come to us for resilient flooring, our professionals work with you from idea to selection to installation. Let us do everything in our power to make your shopping experience a pleasure. 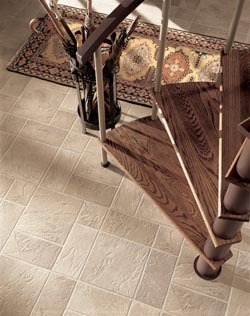 More and more people are choosing luxury vinyl flooring installation for their homes or places of business. This trend is driven by the realistic beauty of luxury plank flooring and LVT, as well as its easy cleaning and maintenance. Luxury vinyl tile looks just like tile made of natural stone, ceramic, or porcelain, while vinyl plank resembles hardwood with its grain and gloss. This flooring option offers home and business owners the look of high-end flooring, plus the big advantage of simple upkeep. All you need to do to keep this flooring looking fabulous is to dry and damp mop when needed. To help you choose the style and color that is right for your space, schedule a free, in-home consultation with our design and sales associates. Resilient vinyl is loved for that springy, cushiony feeling underneath your feet. This comes from the felt or fiberglass backing on the bottom layer of sheet vinyl. Available in 6-inch or 12-inch sheets, this vinyl is embossed to look like hardwood or tile, or an inspiring array of contemporary and traditional patterns in the latest fashion colors. Chose vinyl for durability as this flooring can take on heavy foot traffic, scratches, and spills, as well as energetic children and playful pets and still look great. Wipe up spills of liquid or food with a damp cloth for these floors, which never need waxing. If you would like your flooring to look beautiful and last for many years, choose professional installation. This is the key to enduring beauty for any type of flooring. Let us send a team of installation specialists to your home or business, who lay your flooring according to the manufacturer’s guidelines. A huge advantage of vinyl is that it can be installed in any room of your house, even rooms with high levels of humidity, such as the kitchen, bathroom, or basement. However, careful preparation, as well as attention to detail during installation, is required so vinyl flooring adheres securely, resists damage, and performs for many years. Home and business owners who love hardwood, but prefer easy care and maintenance, can easily have the look of high-end wood. Just pick luxury vinyl plank. This flooring mimics a variety of wood species, down to the variations in style and gloss. It even installs like hardwood planks. Come to our store and talk with our experts about installing luxury plank floors in your home. Contact us today to bring samples of our gorgeous luxury vinyl tile and vinyl plank to your home. To find out more, call us at <PHONE> or use the form to the right. We proudly serve residential and commercial customers in Los Angeles and Inglewood, CA.